Surfaces must be clean, dry and free from oil, grease, dirt, rust, moisture and other foreign matter. Mask adjacent surfaces to simplify cleanup. 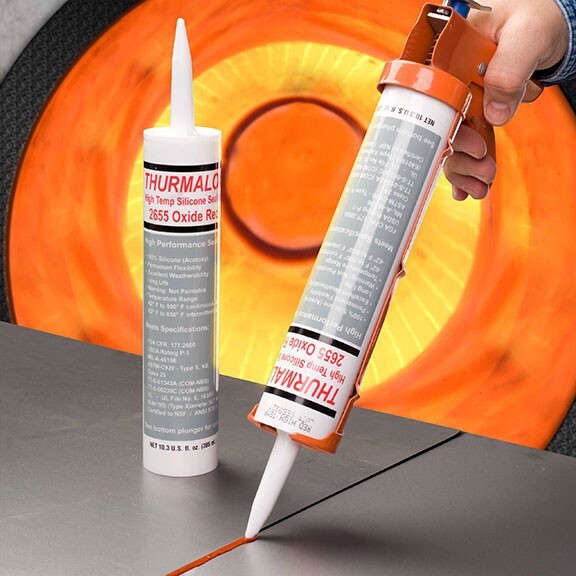 Thurmalox 2655 sealant will bond to most clean surfaces without primers. A field or laboratory evaluation should always be made to determine adhesive strength for specific applications. Difficult-to-bond surfaces should be submitted to Dampney’s laboratory for adhesion testing and primer evaluation. Apply recommended primer if required for increased adhesion. Priming is not required for surfaces previously painted with any Thurmalox heat and corrosion resistant coating. Surface temperature must be at least 5°F (3°C) above dew point. Sealant is supplied ready-to-use and will flow readily from its container under pressure. Apply using manual or air-powered caulking gun after the joint has been properly prepared to receive the sealant. Sealant begins to cure on contact with moisture in the air. At conditions of 77°F (25°C) and 50% RH a skin will begin to form on the exposed surface of the sealant within 15 minutes and the skin will become tack-free within 25-35 minutes. Cure progresses inwardly from the surface. Tool surface immediately after application and before skin begins to form to ensure intimate contact with the substrate. Wipe excess sealant from the surrounding areas and remove any masking tape before skin is formed. Apply sealant between 1/8 in. and 1/2 in. thick maximum. Cure time is affected by RH, temperature, degree of confinement and thickness of sealant. High temperatures and high humidity accelerate the cure and low temperatures, low humidity and confined spaces will retard cure. A 1/8 in. section will cure through in 24 hours at 77°F and 50% RH. Cure time increases with cross-sectional thickness of sealant. Sealant releases acetic acid vapor during cure. Odor will disappear as cure progresses. Allow vapors to escape. If vapors are confined, cure time will be increased or cure may not be completed. Uncured sealant can be removed with Dampney 100 Thinner. For cured sealant, strippers are available which will dissolve silicone rubber. Store below 90°F (32°C) in a dry place. Sealant has a shelf life of 12 months stored in original, unopened containers. Available in 10.3 fl. oz. (305 ml) polyethylene cartridges, 12 cartridges per carton. Keep away from heat, sparks and flame. Vapors may cause flash fire. Do not breathe vapors or spray mist. Avoid contact with eyes, skin and clothing. Use with adequate ventilation during mixing and application. Wear an appropriate, properly fitted organic vapor cartridge-type respirator (NIOSH approved) during and after application unless air monitoring demonstrates vapor/mist levels are below applicable limits. Follow respirator manufacturer’s directions for respirator use. Wash thoroughly after handling. Wear protective gloves, chemical safety goggles and impervious protective clothing. Use skin cream. In confined spaces it is required to use a positive pressure supplied-air respirator (NIOSH approved). Use explosion-proof lights and electrical equipment. Use only nonsparking tools and equipment. Wear conductive and nonsparking footwear. Make certain all electrical equipment is grounded. Observe all safety precautions and follow procedures described in OSHA regulations. See Material Safety Data Sheet (MSDS) for complete precautionary and disposal information. If instructions and warnings cannot be strictly followed, do not use this product. WARRANTY: Dampney protective coating products are expressly warranted to meet applicable technical and quality specifications. The technical data contained herein are accurate at the date of issuance but are subject to change without prior notification. No warranty of current accuracy is hereby given or implied. User must contact Dampney to verify correctness before ordering. Dampney assumes no responsibility for coverage, performance or injuries resulting from handling or use and LIABILITY, IF ANY, SHALL BE LIMITED TO PRODUCT REPLACEMENT. In no event will Dampney be responsible for consequential damages, except insofar as mandated by law. Dampney DISCLAIMS ALL OTHER WARRANTIES OF MERCHANTABILITY AND FITNESS FOR A PARTICULAR PURPOSE.